Our solution makes your customer support PROACTIVE instead of Reactive where customer does not have to dial 1-800 number and answer several questions instead customer scans QR code and wait for the manufacturer’s support centre to call back. This solution is very helpful for organization marketing their products thru dealers to track the end user of their products and also to respond to their support request immediately. 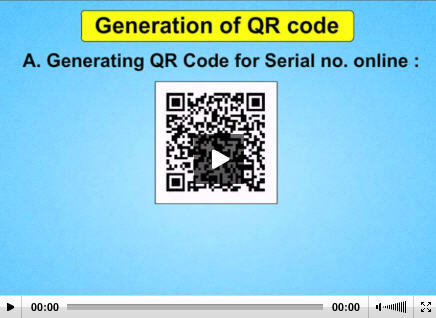 Printed QR Code sticker will be pasted on product including product serial no. 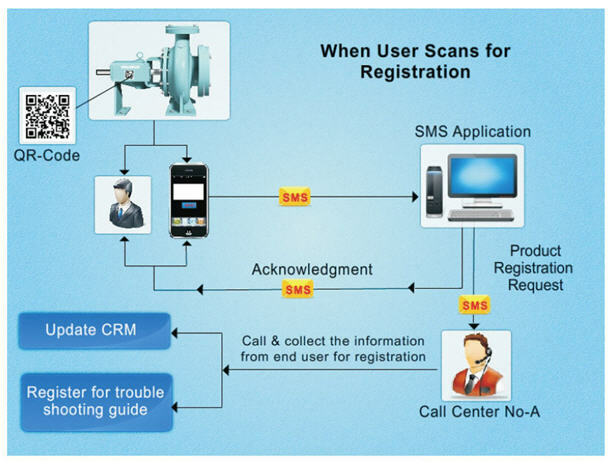 to collect end user contact information as well as product support request. User from his mobile phone will scan QR Code and an SMS message along with recipient no. will be formatted on the user mobile. User has to just send the SMS from mobile phone. On recipient end message will be received from online SMS application and based on internal validation and first time or subsequent time rule application will respond back to the sender as well as send alert to customer care unit for further course of action. 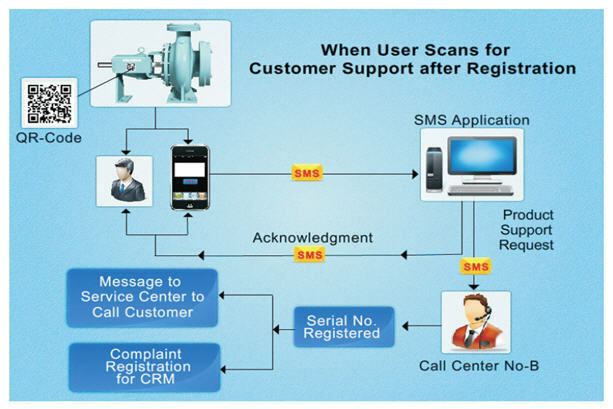 A copy of SMS is also sent as an e-mail to customer care unit linked for receiving alert messages. Makes Customer Support process Pro-Active instead of Re-Active. No need to wait for operator assistance on 1-800 Customer support and answer several questions. Very useful for organizations marketing their products through dealer network. Tracks the end user of the product and also Faster response to Customer support request. SMS syntax along with number on which SMS has to be sent can be encoded in the QR Code. Application provides facility to generate bulk QR Code by selecting a range of data. Printed QR Code sticker to be pasted on product. User has to scan QR Code from mobile and send SMS. Posted message will be received by online SMS application. Depending upon internal validation and CRM policies application will respond back to the sender and send alert to customer care unit for further course of action. A copy of SMS is also posted as an e-mail to customer support executive linked for receiving alert messages. "Mobile based animated videos depicting commissioning and installation of products used in monitoring and operation of boiler system. An effective tool to improve efficiency and customer support mechanism. Received great feedback from users." "Prepared mobile based animation videos for educating drivers of heavy commercial vehicles regarding troubleshooting and fault isolation. Greatly appreciated by then MD Mr. Telang for the accessibility and comprehensibility of the solution." "Sunrise had developed Training Management System to meet our stringent requirements based on our group guidelines and GMP compliances of local as well as international drug authorities. The work was completed to our satisfaction and we wish them success for their projects worldwide." C.G. Kaluskar, Head Tech. Operations & M.S. Shilotri, DGM, FDF Foundation. 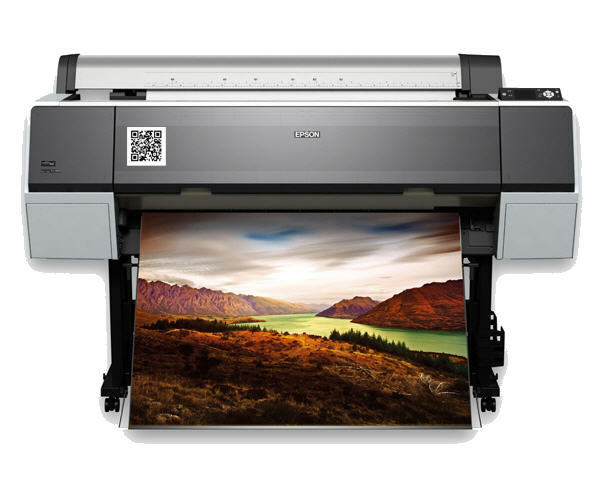 "Sunrise has prepared animated videos to explain the working of Epson System based on their innovative AV Book technology. We found their solution very useful for in-house trainings, customer support as well as product marketing." Jivan Bhatt, CEO, Technova Imaging Systems Pvt Ltd.
"Prepared E-learning manuals for blue collar workers regarding the operation and maintenance of machines at manufacturing plant." © 2000 - 2015 Sunrise Computer Software Pvt. Ltd.